And what about the negative reviews? After I used the word transparency earlier, I’m sure the words ‘negative reviews’ were flashing across your mind. While negative reviews do have the potential to defer some customers, that doesn’t necessarily mean that they must be feared. Plus, if you think about it – if there were no negative reviews, how would the customer ever believe your customer reviews were genuine. In a research done by customer review company, ReeVoo (which we will get to shortly) found that ‘shoppers who go out of their way to read bad reviews convert 67% more than the average consumer’. So if you get some negative reviews, don’t throw in the towel just yet! TrustPilot is a very popular review software use to build up trust with customers. Using this review tool, users are able to upload mailing lists and send out email invites to customers asking to review them (this can also be sent out right after a customer has made a purchase). Reviews are sent to search engines such as Google or Bing. Users can check up on the progress of their reviews, e.g. the number of reviews collected, in a protected environment. You can also respond to assessments here. Feefo is a review tool that works almost the same as TrustPilot. It also sends out emails inviting customers to provide a review. You can choose to customise the display of website reviews, including: rating percentage display, text display and star rating display. In terms of analysis, the dashboard provides integration tools such as an API and a Facebook app for social sharing. KiyOh offers competitive prices and features that are similar to the more expensive alternatives such as TrustPilot. This ecommerce rating and review tool focuses on ratings and reviews. It also includes a Review Alarm that notifies you of any new, incoming reviews – both positive and negative. You can respond to reviews of your customers. Bazaarvoice Suite has an application called Bazaarvoice Conversations that allows businesses to collect review from their customers. Reviews can include opinions, videos and photos. Visitors can also ask questions regarding products. Review tool, eKomi is very similar to TrustPilot in terms of functionalities. eKomi reviews are placed on the user’s website using a widget. Reviews are collected in various ways including pop ups, via email, via a tablet in a physical store and/or via text message. All data is collected in real-time. The review tool TrustSpot is similar to Trustpilot and eKomi. With this tool, users can make a profile page and create widgets for their website to collect reviews. TrustSpot also provides an integrated analytics functionality that gives users insight into how customers are engaging with emails (review requests). This tool offers standard integrations with various webshop systems such as Shopify and Magento. ReeVoo is considered a more high-end review tool. In addition to generic webshop reviews, this tool offers assessments at product level as well. 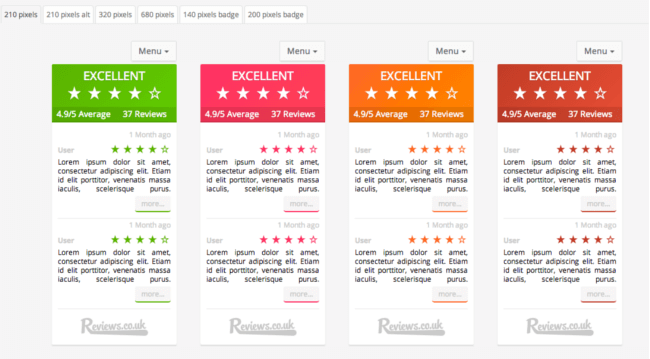 The ReeVoo software runs on-site on your product pages – showing several reviews at product level. Visitors on your site can filter for the most relevant product reviews and if they still have questions, there is an ‘Ask an Owner’ feature available. Reziew is a customer review software with a number of interesting review features including video and photo reviews. This review tool also offers advanced product review syndication enabling the user to collect large volumes of review across various websites. 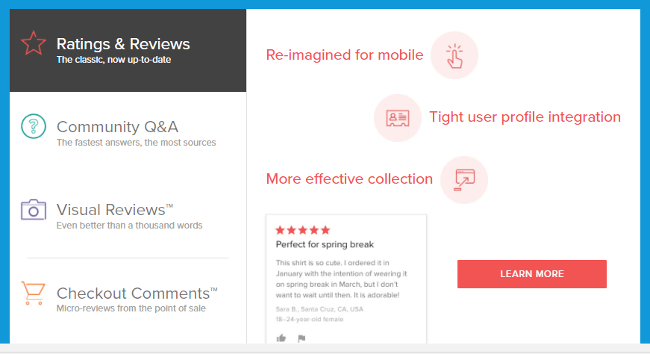 Users can carry out conversations with customers in response to reviews in Reziew’s ‘Moderation platform’ as well as track all user data in detailed reports. Yelp is one of the most popular internet review and rating sites out there. Intended for local businesses and restaurants, Yelp makes use of long-form reviews to get detailed information out of its ‘reviewers’. 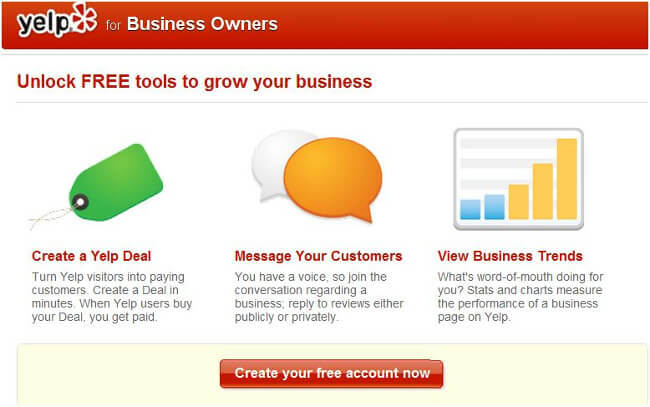 To start receiving reviews, your business just needs to active a Yelp business page. You can also add a badge to your website requesting reviews or send out a link in newsletters. Yelp provides a free suite of tools where you can respond to these reviews as well as track visitor engagement. Reviews.co.uk offers product reviews, company reviews, and in-store customer ratings all on one platform. Users can reply to reviews in real-time as well as request reviews via a customisable email. Reviews.co.uk also offers social integration so that your Twitter is constantly updated with fresh content..
Yotpo offers a wide variety of solutions in its suite. This review tool is specialised in review generation. It send outs automated emails to customers right after purchase for both review and upselling purposes. You can also place Yotpo’s customisable widgets wherever you want on your own site. These widgets includes a trustbadge, in-depth info about the reviewer, and they allow you to ask your buyers questions that might help them make a decision. PowerReviews is a customer engagement engine that allows users to collect reviews from customers as well as answer questions customers have. These reviews are distributed to all major search engines using their advanced syndication network. This review tool can also measure social traffic and content generation and see how this affects conversions and sales. TestFreaks provides its users with syndicated reviews taken from thousands of expert and consumer review sources that can be matched with the user’s product feed. It also includes a Review Collector feature that, similar to Yotpo, sends a branded email to your customers post-purchase asking for a review. On top of that, TestFreaks provides a review analytics solution which collects scores, sub-scores and pros and cons wherever possible. 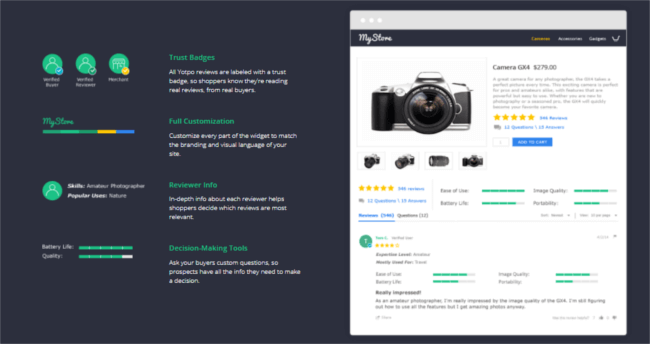 TurnTo is a customer review software that captures four different types of content generated by users: Ratings & Reviews, Community Q&A (social answers), Visual Reviews (customer generated images) and Checkout Comments (short reviews from the point of sale). This review tool can be integrated with customer profiles to further personalises the user experience. 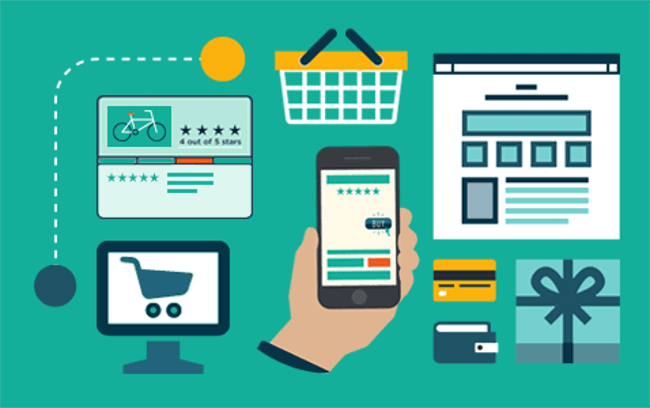 We hope you this overview has given you some good insight into which ecommerce rating and review tool(s) will help you gain transparency as well as trustworthiness among your online customers. Keep in mind that while many of these review tools are great for collecting the opinions of your customers as they pertain to products and services, they lack the ability to provide deep insights into other sales drivers such as, for example, online processes, usability, the customer journey and more – which is why complementing your review tool with user feedback is highly recommended.